Need an experienced Murwillumbah electrician for your home or business? We have been helping customers across the Tweed, Northern NSW and Gold Coast for more than 50 years. Larkin Electrical can help with all types of electrical services including power connections, switchboards and metering, solar connections, expert advice on lighting design and product selection, phone and data solutions. We are also service agents for many major appliance and lighting suppliers. Larkin Electrical is a trusted supplier and electrical contractor for many builders, government agencies and businesses across Northern NSW, Murwillumbah, Tweed and Gold Coast. Our Murwillumbah electrician team works seamlessly as part of large construction teams to deliver many successful projects. We are part of The Lighting Network – a cooperative group of independent lighting retailers across Australia – delivering better value and support to our customers. Our collective buying power means we can pass on more savings and bring you all the latest lighting trends. Larkin Lighting and Electrical has been serving the community for over fifty years. Our team includes licensed Level 2 authorised electricians qualified in all types of residential, commercial and industrial installations. Book an appointment with a Larkin Electrical Murwillumbah electrician today. The times they are a’changing. Back in the day, energy saving focused on simple, short term measures to save on energy bills. Heating and cooling were the main culprits. These days, energy efficiency planning is much more comprehensive. Larkin Electrical offer energy audits to help you reduce the energy costs around your home or business, including information about government grants. We can look after all your solar connections. Contact us for advice. 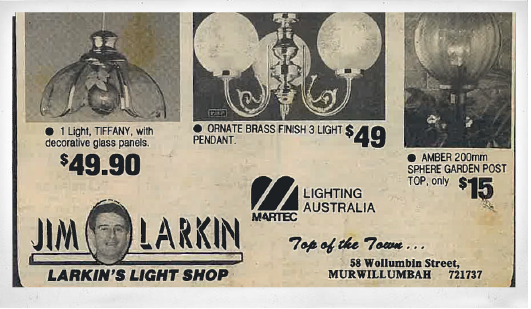 Larkin Lighting and Electrical is part of the Lighting Network group of independent lighting retailers across Australia. Our Level 2 Authorised electricians can meet all your electrical needs. Contact us today. Larkin Electrical are experts in electrical services and lighting products. Our residential, commercial and industrial electrical contractors have been helping customers across Northern NSW and Tweed for more than 50 years.